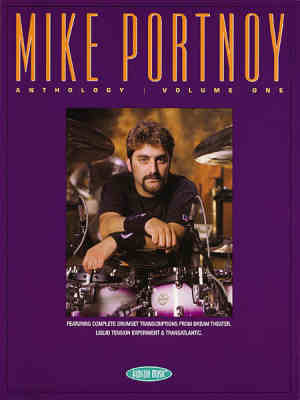 This book contains transcriptions of some of Mike Portnoy's best known works from Dream Theater, Liquid Tension Experiment, and Transatlantic. Let's check it out. I have to give credit to those who transcribe drum parts. It is a time consuming task and, especially when you're transcribing a drummer who plays as many notes as Mike in songs as long as Mike's, it's an extremely difficult task. But I have to hand it to Steve Ferraro, who transcribed every note in this book. He did a great job! Transcriber's Notes: The book opens with an explanation by Steve Ferraro who details exactly what it took for him to transcribe the nine songs that are included in this book. Each of the book's nine song chapters follow the same format beginning with performance notes written by Mike himself, transcription notes by Steve Ferraro, drumkit diagram, notation key, and the drum chart itself. The transcriber can make or break a book like this. Fortunately, Steve Ferraro has done an excellent job. Especially considering that one of the songs that he had to copy is 31-minutes long! I highly recommend this book to all Mike Portnoy fans as it contains some of Mike's best known grooves and signature fills. And metronome times are included so you can compare your chops to Mike's. Even if you're not a fan I suggest you take a look at it anyway. It just might give you some ideas that you can incorporate into your own drumming style.